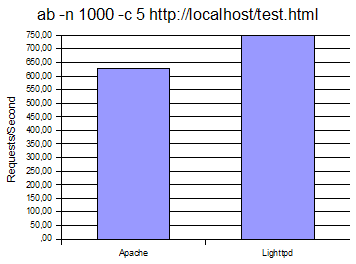 This benchmark shows how Apache2 (version 2.2.3) and lighttpd (version 1.4.13) perform compared to each other when delivering a static HTML file (about 50KB in size). 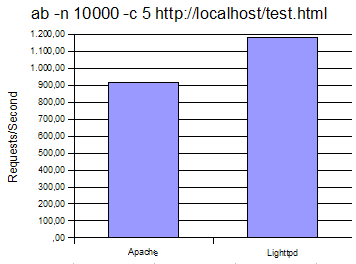 This benchmark was created with the help of ab (Apache benchmark) on a VMware vm (Debian Etch); if you try this yourself, your numbers might differ (depending on your hardware), but the tendency should be the same. I have tested this on a Debian Etch system with 512MB RAM inside a VMware vm on a system with an Intel(R) Pentium(R) M processor 1400MHz (yes, quite old, but as I said in the introduction, the tendency should be the same on other hardware). Apache 2.2.3 mpm-prefork with default Debian configuration. Lighttpd 1.4.13 with default Debian configuration. The HTML file I've used to test is a copy of the HowtoForge frontpage with a size of 49128 bytes. I've saved it as test.html. -n is the number of requests to perform for the benchmarking session; -c is the number of multiple requests to perform at a time. - The default configured apache that provided by hosting providers is not a good choice, some twisting is needed. You seem to have a problem in your test since all apache2 fields are filled with "apr_socket error" And I frankly would not believe that it is Apache2 is guilty that your test failed. 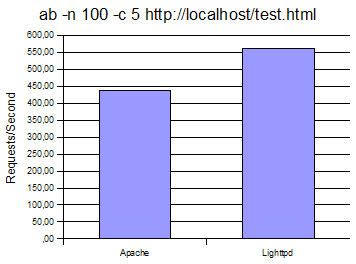 You should use other tools for HTTP testing, 'ab' has a very limited scalability!